Tokyo is described by Roland Barthes in “Empire of Signs” as some kind of void, a city whose “centre is no more than an evaporated ideal whose existence is not meant to radiate any kind of power, but to offer its own empty centre to all urban movement as a form of support…” Initially seemingly a rather harsh description of a metropolis brimming with history and contemporary culture, this judgment by Barthes actually sheds useful light on the Tokyo Culture Creation Project’s recent activities. Cities in Japan are much like ever-expanding villages that have grown upwards and outwards in a natural evolution, and whilst Tokyo has been repeatedly damaged or destroyed by earthquakes and their aftermaths, it has always been rebuilt preserving its Edo geography. 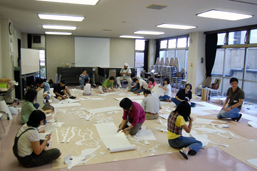 As urbanist Shabbar Raza has argued, based largely around sacred spaces devoted to Edo temples, Tokyo is made up of a composite series of ‘centres’ that present psychological and physical spaces for gathering. 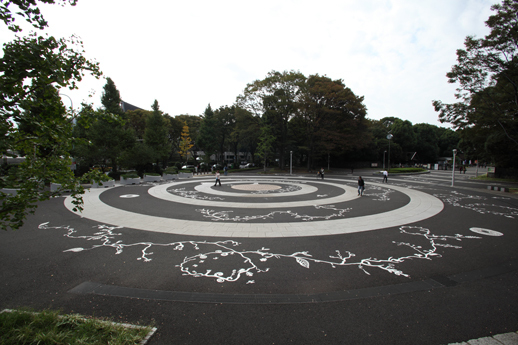 “Shokubutsu ni natta Hakusen”, a public art project at the Harajuku Gate Entrance to Yoyogi Park, is a space that could be described as ‘centre’ and said to function in this way. 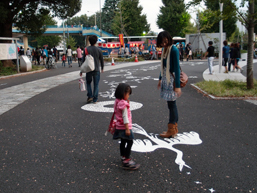 Carried out over an extended period in late 2011, this venture was one element of the Park Project overseen by the Tokyo Culture Creation Project, as part of its Tokyo Artpoint Project programme, an initiative aimed at uniting artists and residents through art-making, and encouraging collaboration across the capital’s various platforms and locales. 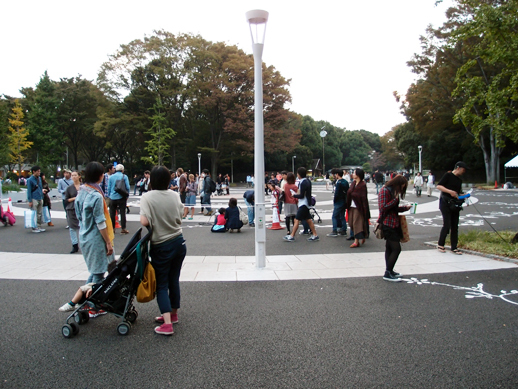 The choice of location is key here, for Yoyogi Park is one of Tokyo’s most popular parks, and the Harajuku Gate Entrance is a bustling spot that every stratum of society frequents. Pass by on a Sunday and if the weather is fine, you can spot not only meticulously stylized youths milling through en route to Takeshita Street, but also a dedicated group of veteran rockabillies that religiously perform their rock and roll dance step across the plaza, as well as tourists of all ages taking a scenic route to Meiji Shrine. 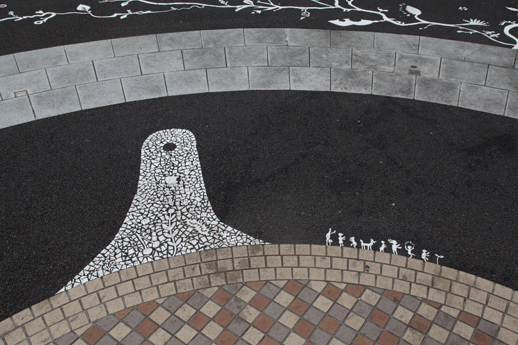 The project was headed by Tokyo-born Yusuke Asai (1981-), a young but prominent artist whose multimedia, loosely illustration-based work has been exhibited both nationally and internationally. 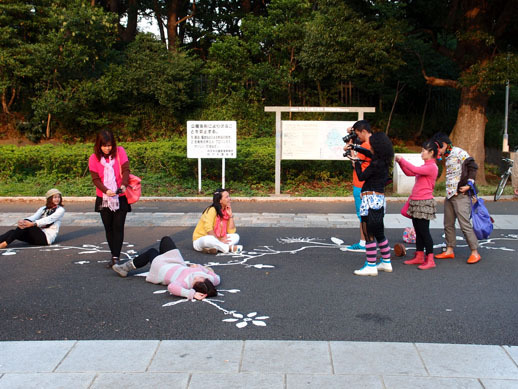 Since 2006, he has made many site-specific installations, in conjunction with workshops. 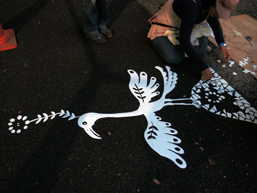 Back in 2008, Asai created a 180-metre white line on the streets of Nippa, Yokohama. 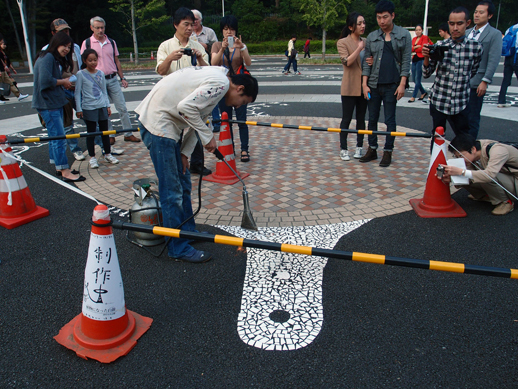 Using sheets of the heat-applied thermoplastic material that are normally utilized for white road markings, Asai cut, and later fixed, an extensive leafy motif that organically branches out and carries lines down the street. 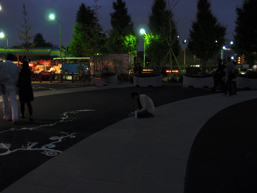 Titled “Shokubutsu ni natta Hakusen”, which translates as “white lines that have become plants,” this work is the first of many sprawling works using the same name and techniques which can be found in Osaka, Fukuoka, and indeed Tokyo. 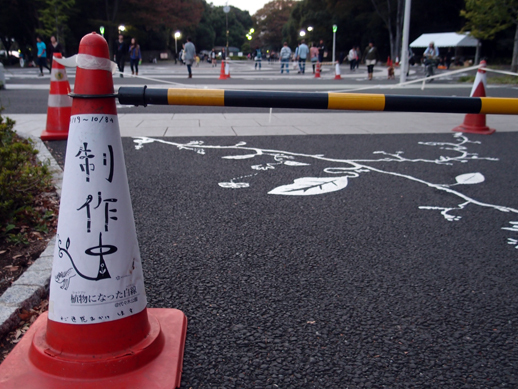 The first in Tokyo was in Koganei, a suburban area twenty kilometres west of the centre. 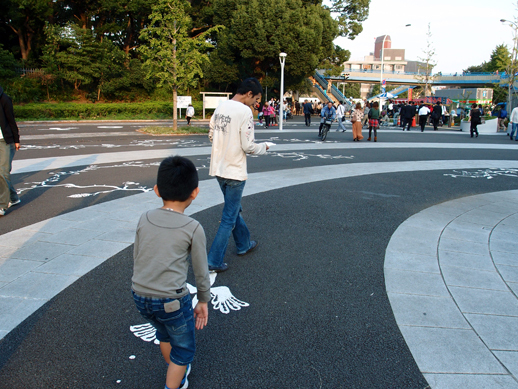 Completed in early 2011, it comprises a number of sites, including a car park and an elementary school. 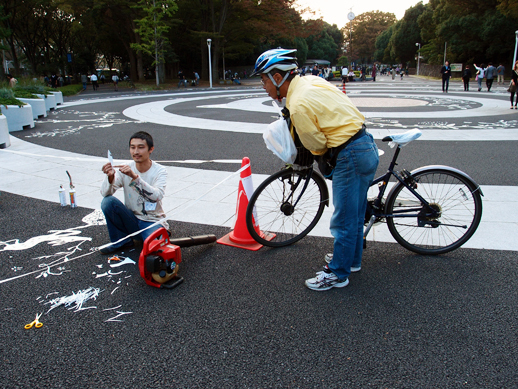 Just a few months later, Asai was already working on the piece now in Yoyogi Park. 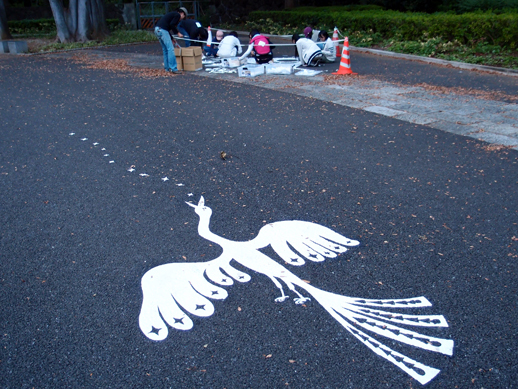 What makes each of these projects unique is Asai’s connection with the site and its inhabitants via the manner in which they are executed. 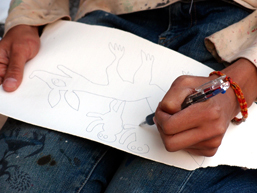 Produced predominantly through an Open Studio held over six days in late September and early October, both children’s workshops and adults’ workshops allowed the whole community to take part and determine the final work. 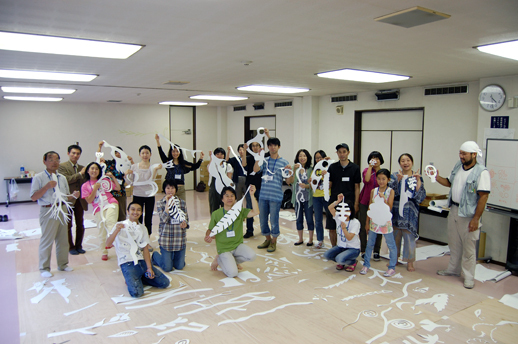 Within the workshops, participants were directed by Asai to create directly from their mind, rather than being stunted by “drawing” and the concept of representation. 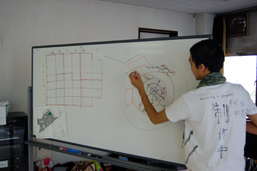 To aid this he gave participants scissors rather than a pen. 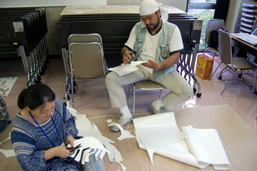 In this situation, the hands are encouraged to move more independently of the head, which Asai believes to be very valuable. “Lots of good things get made when it’s the ‘body’ that has made them, where you just have to use your hands where you like it or not,” he says. This approach is reminiscent of the Automatism that the early Surrealists selectively employed for their drawing and writing. However, rather than being a record of the subconscious, as the avant-gardists believed it to be, Asai’s approach relates much more the the temporality of the individual involved, at a particular location at a particular time. 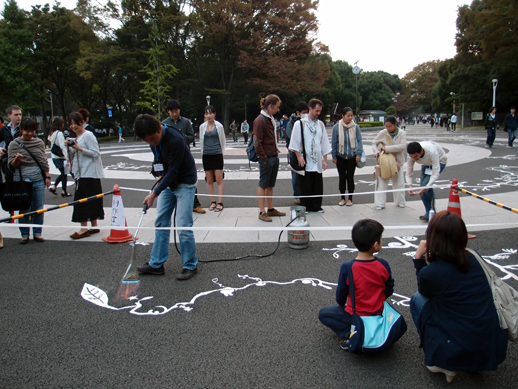 “Compared to the other places where I have created the white lines, though, the number of people visiting Yoyogi Park is much, much higher,” Asai explains. 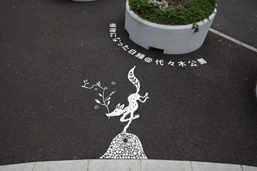 In listening to this rhythm of the locale, and by following the sense of time cultivated there, participants depicted animals and foliage in instinctive and intuitive ways. 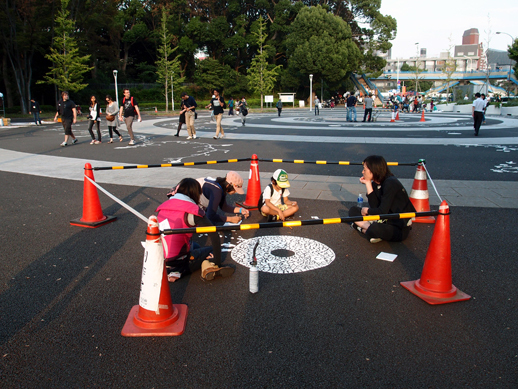 By entering into this dialogue with the space in which one is working, and with the people that inhabit or pass through it, Asai believes connections are developed and relationships fostered. The methodology of the piece is thus like the opening of a conversation, a conversation that continues long after its completion. 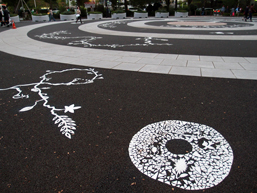 Completed on October 8th, 2011, the plaza is now covered in magnificent white creatures, vegetation and patterns to become a space that draws people in, offering them a welcome pause or inviting encounters within. 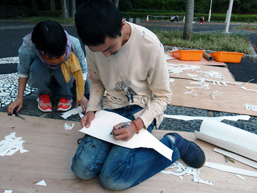 A similar opportunity to use and enjoy a public space in a new way can be found at the Arakawa ward’s Shioiri Tower, another of Tokyo Culture Creation Project’s Park Projects, which was conceived by architect Tadashi Kawamata. It opened to the public in April 2011 and an anniversary workshop was recently held on March 25th, with professional dancers, musicians, artists and locals gathering at the tower. 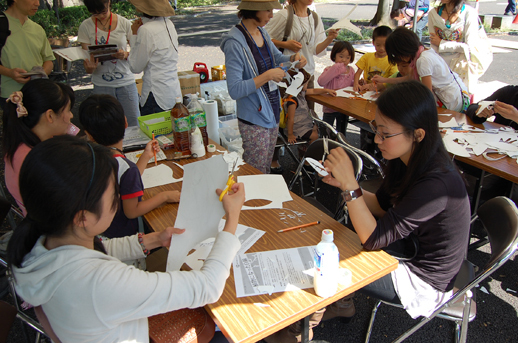 Nozomi Sawaguchi of Omu-tone, a three woman percussion unit, led participants in fashioning homemade musical instruments, whilst dancer and choreographer Momoko Shirakami from Momonga Complex gave a performance.